1. It explains that knowledge is power. 2. Wit is the greatest asset. 3. Wit helps to rise a person from the root and can take to the top. 4. In the “survival of the fittest” the wisest wins. 5. A friendship can happen between any two persons regardless of their social or economic status, if one admires the qualities of the other and vice versa. The list can be made longer and longer. But the fact is, all these stories somehow touches the reality of society and they are as applicable today as they were in the reign of Akbar. If we explore our surroundings we will definitely find incidents similar to those mentioned in the stories. As it is the fact that no society can live without wise men; the elders always try to implant wisdom, wit and qualities in the coming generation since childhood. Though childhood is the best time to learn anything, at that stage a person is not capable to understand the jargon, heavy philosophy and logic. The easiest way to teach children is to give them knowledge with fun, so they find it enjoyable like playing any game but along with they understand what is right and what is wrong. What should be done and what shouldn’t? How to tackle the tricky situations and all the other stuff a wise man should be armored with.The “Akbar-Birbal tales” does the same thing and that’s the reason they are popular so much. 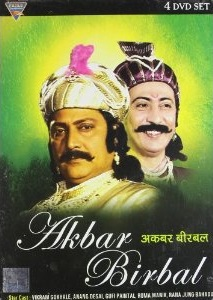 The son of Humayu and the grandson of Babar – the Mughal Emperor Akbar is known as “Akbar the great”. Birbal – some says its fantasy character, some says its real. Well, who cares? He has already acquired such a special place in the hearts of people of all the age and religions, that the conflict about his identity does not affect the impact of the personality of him. It is said that he was Mahesh Dash – a brahmin boy, before named as Birbal. The well-known information is, in Akbar’s court there were “nine gems” (known as Nav-Ratna) who were expert in their own fields and Akbar used to discuss important matters with them, to finalize his decision.